Homecambridge first B2A lesson on B2 first certificate writing skills with exercises 6. May 18, 2018 julia cambridge first B2 Comments Off on A lesson on B2 first certificate writing skills with exercises 6. 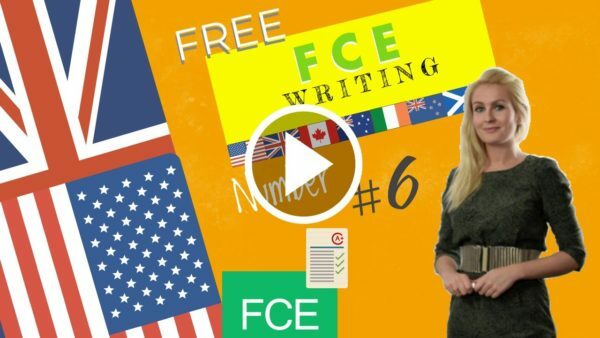 FCE Course Lesson 15 – A lesson on B2 first certificate writing skills with exercises 6. This Dialogue presents you with 4 unusual stories about relationships to prepare you for the FCE listening and tips on Writing of a report. The purpose of a report is to offer the full meaning of the book or original research, but in a more condensed form. A report must be precise, objective, concise and clear. (1) I’ve been going out with my boyfriend for 3 years now. Our relationship is filled with joy, laughter and happiness. We spend our time together doing the usual things that couples do, we go to the cinema, we go to restaurants and we spend our Saturday nights curled up in front of the television with a Chinese takeaway, watching rubbish TV. There is just one thing which differentiates us from other couples, my boyfriend is 50 years older than me. We started dating each other when I was 18 years old. I met Ralph through my auntie, who he dated for 6 months before realising there was no spark there. I got along with him every time we spent time together, so I decided to get in touch with him on Facebook. We talked for a few weeks before arranging to meet up. Everything in theory was telling me that I was doing something wrong, and it was weird and disgusting. But when we were together, there was such an undeniable chemistry that I forgot about all of that. I knew straight away that I had seriously fallen for him. Whenever I wasn’t with him, I was thinking about him. We tried to keep it from our families but my auntie logged onto his Facebook account and saw the loving messages that had been exchanged between Ralph and I. She went off the rails, saying that she wanted to kill me and telling everyone in my family about our relationship. It was at that moment that I moved in with Ralph, we acknowledged that although it would be difficult for me to segregate myself from my family, there was no way that we could be apart. Three years later, my family still doesn’t speak to me. I had a phonecall from my mum last Christmas who told me that she loved me and missed me, but couldn’t condone my relationship and therefore had to cut me out of her life. Yes, Ralph is 71 and I’m 21 but we are on the exact same level of thinking, maturity and attitude towards life. I am blessed to have him in my life and for as long as we can be together, we will be. (2) It is difficult to know how to congratulate a man who has walked himself down the aisle and married himself, because one does not know whether to compliment the groom or the bride. 39-year old Liu Ye from Zhuhai city, in southern China, married himself in front of more than 100 guests at a traditional Chinese courtyard. The wedding took place at the Guanzhou Village before friends and bewildered local villagers. His blushing bride was represented by a foam cutout of himself in a red bridal dress and the two were accompanied down the aisle by one bridesmaid and one groomsman. Ye seemed to prefer a traditional wedding as he bowed to the ancestors and to the senior guests in return for their blessings. All procedures of an ancient Chinese wedding were honoured and the bride and groom made the traditional rounds of toasting guests during the banquet. Ye vehemently denies being gay, but admits to being “a bit narcissistic”. Ye believes that he has many reasons for marrying himself, but his main reason is to express his dissatisfaction with reality. He claims that marrying himself makes him whole again and that his definition of marriage is different from others. Ye also believes that single people are generally marginalised and they are assumed to not have the commitment to be in a relationship and are too picky. Online reactions to the controversial marriage were varied. Whilst some encouraged Liu’s self-centred love, others were confused about the practicality of the marriage. One commentator wrote: “I would have thought the whole marriage thing was a bit redundant though. I mean, what’s the point of promising yourself that you’re going to be with yourself forever? Isn’t that just kind of a given?”. (3) Nene Anegasaki is a third year high school student who works part-time in a family restaurant. She loves housework and horror films and doesn’t pick fights. Her favourite food is mint lozenges and she is a dependable big sister. That is why the 27-year old gamer, Sal 9000, decided to marry her. The only problem: Nene is a videogame character in the Nintendo DS game called “Love Plus.” “Love Plus” is a Japanese dating simulation game by Konami for Nintendo DS. The game consists of three stages. The first stage is “The Courtship”, in which the player courts and woos the girl, and the game progresses from there and the following stages consist of increasingly physical contact between the player and the girl. However, Sal 9000 did not stop there. The gamer, who wouldn’t reveal his real name, married Nene in a ceremony witnessed live online by thousands. The ceremony took place on Guam, a small island in the west Pacific Ocean, whose main source of income is from primarily Japanese tourism. Though not legally binding, the wedding was Sal’s way to express his devotion to the avatar. He believes that Nene is his dream woman. “Her character changes to my liking as we talk and travel to different places”, Sal comments. This is not the first time the Japanese Internet community witnesses relationships and marriages to avatars, though it has normally been confined to the virtual world. Sal is adamant that his love is valid, and he believes that he loves the character, and not the machine. He says he understands that it is a game, but does not feel the need to find a human girlfriend. Reactions to the wedding have been of varied opinions. One commentator was sceptical about the whole idea, and wrote: “Something tells me he doesn’t really care about the bride or the wedding as much as he likes being anti-traditional. Then again, maybe I am a cynic”. Others were more positive and claimed that Sal 9000 was their “hero”. How to write a report for b2 first certificate.